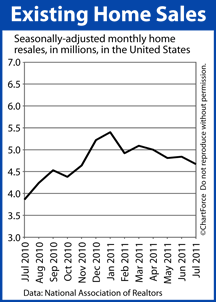 Home resales slipped in July. According to the National Association of REALTORS®, Existing Home Sales nationwide fell to 4.67 million units on a seasonally-adjusted annualized basis last month. It’s the fourth straight month below the 5 million mark, and the report’s lowest reading since November 2010. In addition, the Existing Home Sales report showed home supplies rising nationwide. At the current pace of sales, in other words, the complete, national “For Sale” inventory would be exhausted in 9.4 months. This, too, is the worst reading since November 2010. On a units basis, however, the number of homes for sale actually fell in July. As compared to June, home resale inventory dropped 65,000 units to 3.65 million. From these figures, we can infer that, despite low mortgage rates and lagging home values, buyer activity is slowing in TX and nationwide. This may be seasonal, or it may be a long-term trend. Either way, there’s opportunity for today’s home buyers. With mortgage rates at all-time lows, home affordability is peaking. More households can afford housing payments than during any time in history and with the fall season approaching, buyers in Port Aransas may find contracts negotiations to be more “friendly”. This can mean lower sale prices and larger concessions from sellers — the hallmark of a Buyer’s Market. It’s a good time to look at your options. Talk to your real estate agent and see what’s out there for you. Low home prices may persist, but low mortgage rates likely won’t.